If your dog has IVDD (intervertebral disc disease), then his chances of getting better are affected by the severity of his disease. This is worked out mainly from the dog’s clinical signs (symptoms). Some vets give IVDD patients a clinical grade. 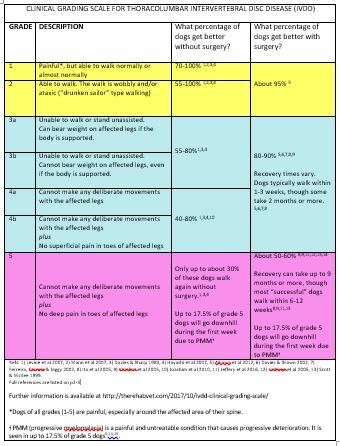 This can be useful in working out the dog’s prognosis (how likely he is to get better) and can also make it easier to record any improvement or deterioration. Various grading systems have been used worldwide. One that is often used in UK practice has grades from 1-5, with grade 1 dogs being most mildly affected, and grade 5 dogs being most severely affected. Of course, some vets do a great job of assessing, treating and monitoring IVDD dogs without giving them a grade or number. This section of the website has however been added in for those clinicians and owners who do wish to refer to a grading system. To take a look at the table above, please click here. This link opens up a clearer, printable version in a new window. If you are wondering what treatment options might be available for your IVDD-affected dog then please click here. 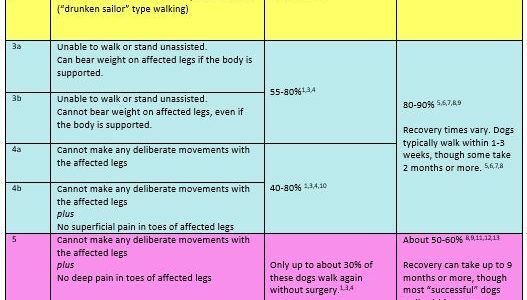 If your dog is unable to walk and your vet has also told you that he is so severely-affected that he has “no deep pain” (grade 5) then click here. The above three links include information on treatment options, more specific home care requirements, problems to watch out for, and a typical timescale of recovery. can i know is it any method for grading cervical ivdd?? A grading system for canine cervical IVDD has been described by Tanaka et al (2005)as follows: Grade 1 is neck pain but walking normally; Grade 2 is mild tetraparetic [“wobbly” on all 4 legs] but does not fall, with or without neck pain; Grade 3 is moderate tetraparetic [able to walk but frequent falling and “wobbly” on all 4 legs] with or without neck pain; Grade 4 is severe tetraparetic [unable to walk] with or without neck pain. This is some of the most comprehensive information that I have been able to find. Thank you for your well thought out and informative page.